2a. 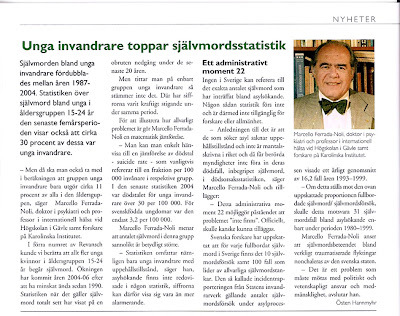 Here is the link to the referred article I published in DN-debatt "Självmorden ökar starkt bland unga invandrare" (Suicides increases strongly among young immigrants). The scanned full text down below (click on). 2b. The other aspects taken in the Revansch interview about suicides among asylum applicants - and which Sweden do not register in the official statistics of suicide - were previously elaborated in my article in Aftonbladet "Staten nonchalerar flyktingars självmord" (The State neglects the suicide of refugees) . A summary in English of the Aftonbladet article can be obtained here. 2c. Also in Swedish, this article in Läkartidningen "Traumatisk stress och flyktingars suicidbeteende. Epidemiologiska fynd"
" Suicide among young immigrants double increased between the years 1987 and 2004. The last five-years statistics on suicide among youngsters of age 15-24 years old also show that about 30 percent of those were young immigrants". It is worthy to note that young immigrants were only 11 percent of the total population of that age group in Sweden. The suicide rate for native young Swedes was only 3.2 per 100 000, whereas for young immigrants the suicide rate was 30 per 100 000. (From an interview published in the last issue of Revansch, the journal of the The Swedish National Association for Social and Mental Health (RSMH) "Unga invandrare toppar självmordsstatistik". Article by Östen Hannmyhr). 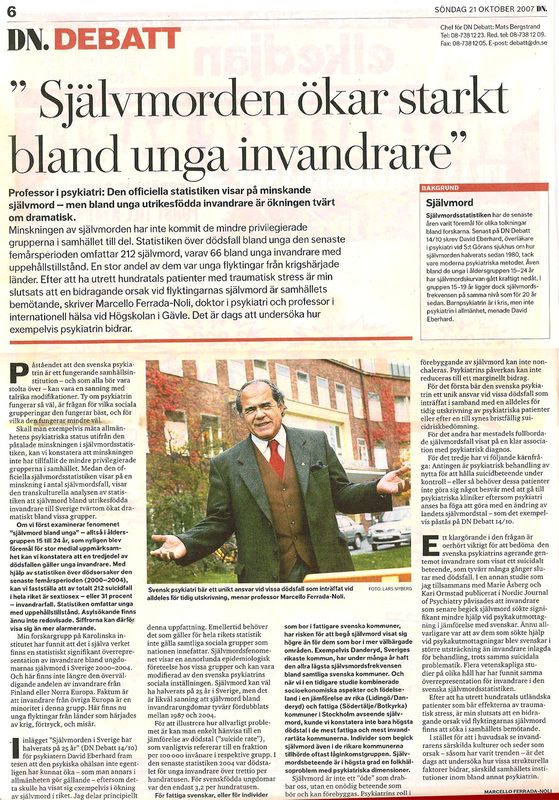 The interview was conducted after the publication of my article in Dagens Nyheter "Suicides increases strongly among young immigrants" (in Swedish). I insert here below the full text of the article/interview in Revansh. Click on.